I recently learned about this method of cooking a chicken from Martha Stewart’s Living. It looked intriguing and not too complicated, so I decided to give it a go. It turned out to be amazing. 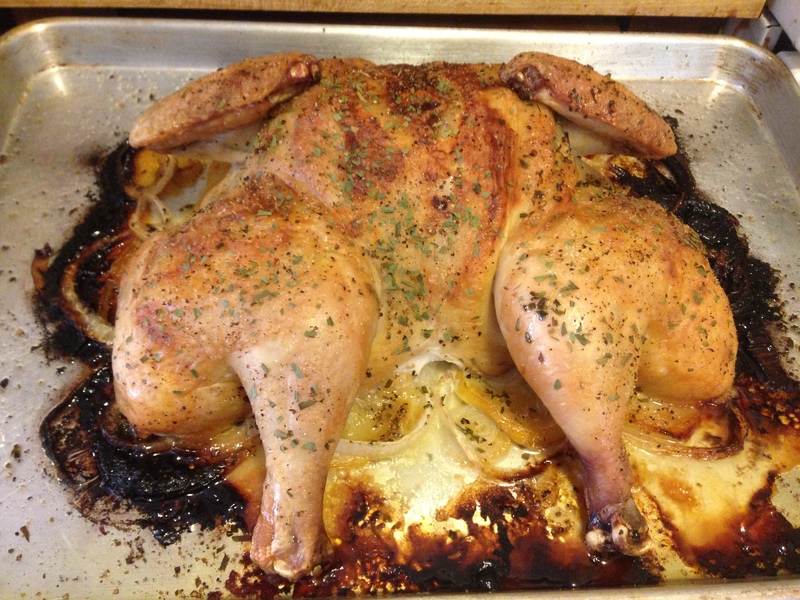 The bird comes out very flavorful and moist, and the skin is evenly crispy across all pieces, and it will make your house smell absolutely delicious. I’ve made it several times since, and I think I’ve improved upon the original recipe. Here’s how I do it. One whole chicken, 4-6 pounds. Seasoning: salt and pepper, other herbs and spices, as desired. Preheat the oven to 425°, and spray the baking pan with non-stick spray. To spatchcock the chicken, remove the neck and giblets, and lay the chicken breast-side down on a cutting board. With a pair of kitchen shears, cut along either side of the backbone, and then discard it. Open the chicken up, like a book. To make it open flatter, make a shallow cut inside along the center and press the bird flat so the keel bone pops up. You should then be able to pull it out with your fingers. Slice the lemon and onion in very thin slices. You should end up with several slices of each. 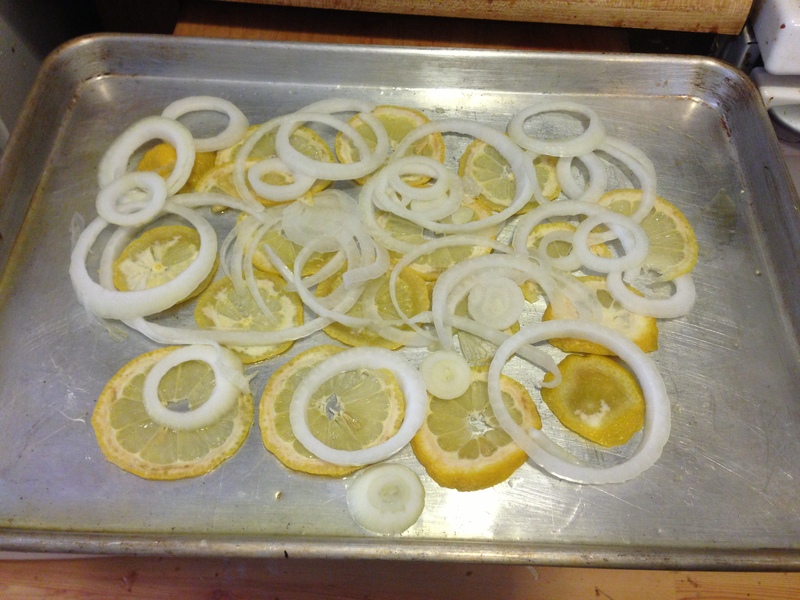 Lay all the lemon slices and most of the onion slices in the center of the baking sheet. You want to cover an area large enough to fit under the bird when it is flattened out, while reserving 4 slices each of onion and lemon. When the lemon and onion are all arranged on the pan, lay the chicken on top, skin side up. Starting at the neck, carefully separate the skin from the meat over the breast, using your fingers and keeping the skin intact. Slide the remaining slices of onion and lemon under the skin and arrange them evenly so they lay as flat as possible, and arrange the skin so it covers the meat. Generously season the entire chicken with salt and pepper. Other herbs and spices can be used by personal preference, but I like garlic powder and tarragon. Bake for 45 minutes for a bird that’s about 5 pounds. You may need to adjust the time by a few minutes if your chicken is larger or smaller. The done temperature for breast meat is 165°. When it is done, let it rest a few minutes while you get your veggies and sides ready, then portion out the chicken, removing the lemon and onion slices from under the skin. Leftovers are very good, and you can use them for salads, soups, casseroles, or just eat them as is. UPDATE: I just tried making gravy with the juices and onions, and I thought it was amazing. After you cut up the chicken, move the pieces to a plate. Put all the onions and juices from the pan into a cup (none of the lemons! ), and then puree everything with a stick blender. I used a 1 C. Pyrex measuring cup. It required no extra thickener; pureeing the onion with the pan juices made a perfect gravy texture. It was a very light brown, so if dark gravy is something your household prizes, add a few drops of caramel coloring. It had a really great flavor, both pleasantly tart and savory. It only took about one minute to make, so try it out and see if you like it as much as me. If not, the worst that can happen is that you have to clean one cup.